How do mats play a part in green cleaning? 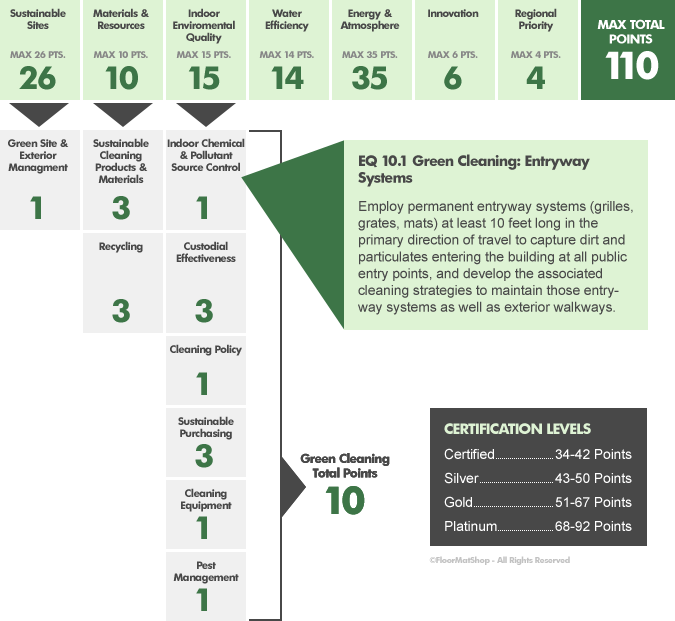 The U.S. Green Building Council has developed a rating system for new and existing buildings to promote the design and implementation of cleaning programs using environmentally preferable products and processes that have a lesser or reduced effect on human health and the environment. Choosing the right combination of mats for both inside and outside the building provides a safe, effective, and attractive surface. Scraper mats are deisgned to stop mud and larger particles of dirt from being tracked inside buildings. These mats provide aggressive scraping action and trap dirt and debri in recessed areas until the mats are cleaned. Scraper Entrance mats can be used outside or inside and should be used in conjunction with a Scraper/Wiper Mat and a Wiper Mat. 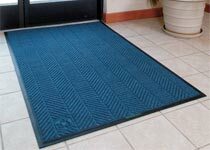 Wiper/Scraper Entrance Mats are designed to provide scraping action and wiping to further stop dirt and moisture from entering a facility. These mats are typically made of tough fabrics. They channel and retain dust in recessed grooves while absorbing moisture in the fabric face. Scraper/Wiper Mats are primarily used inside buy may be used ouside as well (where indicated). These mats should be used in conjunction with a Scraper Mat and a Wiper Mat for maximum performance. Wiper Floor Mats are designed to stop any remaining dust and moisture left after using a scraper mat and scraper/wiper mat. These mats are made with carpet facing to complement most interiors. Wiper Mats are for indoor use and when used in conjunction with a Scraper Mat and Scraper/Wiper Mat, they can stop as much as 70% to 80% of dirt and grime from being tracked into a building. Anti-Fatigue and Cushion Mats are available in a wide range of sizes, weights and materials. It has been proven that the proper use of anti-fatigue mats can enhance worker productivity by over 20%. These anti-fatigue mats are designed for use wherever workers spend time standing and will help to eliminate muscular skeletal disorders. 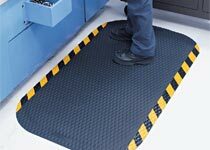 Flow-Through Mats allow liquids to pass through them to eliminate slip hazards. Anti-Fatigue properties provide comfort when standing for long periods of time. The thick rubber helps alleviate stress on the legs, feet and lower back. 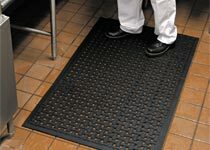 Flow-Through Mats are primarily used indoors however, when applicable, work perfectly in outdoor situations where slip-resistance is necessary. 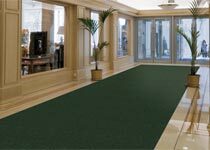 Eco-Friendly Floor Mat Runners are designed to provide safe footing with minimum movement in any environment. Floor Runners are ideal for numerous production locations, walkways, gym floor protection, parts counters, lab areas and food service applications. 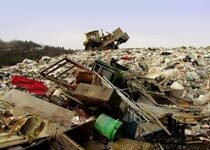 One of the most important parts of the Green Building Program is concern for the environment, including the use of products that can help reduce the need for landfills. The key issue with mats is a mat's performance lifespan. 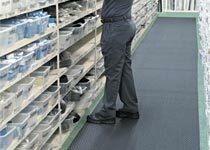 High-performance mats can have a performance life of many years. Many of the high-performance products available through our online catalog have extended warranties, some up to 6 years. Other mats with inexpensive construction have a 90 to 180-day performance life. 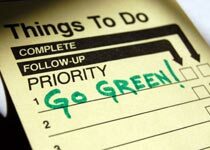 To function effectively in a green building, sustainability is key. Low-performance mats will need to be replaced more frequently causing a disposal issue.